Cookbook #240: Nabisco’s Snack Book, The Pillsbury Company, 1970. Note the author of the introduction – Mary Ellen Baker, Home Economist. “Baker”? Really? Her signature is right there. Web searches pulled up nothing about her. 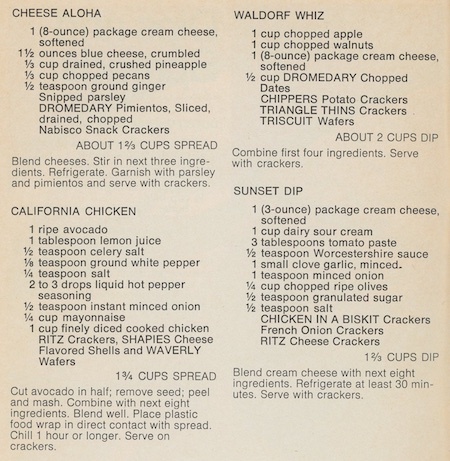 Like so many appetizer books of the sixtie and seventies, most recipes in Nabisco’s Snack Book call for cream cheese, sour cream, various cheeses, packaged meats, and condiments. 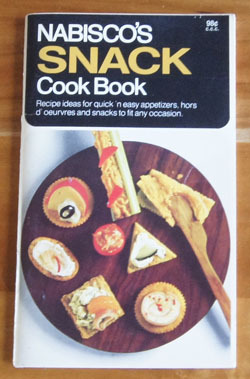 And, in every recipe in this book, there is a Nabisco brand-name ingredient: Triangle Thins Crackers, Chippers Potato Crackers, Triscuit Wafers, Dromedary Pitted Dates, Flaked Coconut Snack Crackers, Sociables Crackers, Waverly Wafers, French Onion Crackers, Premium Saltine Crackers, Mister Salty Veri-Thin Pretzels, Snack Mate Pasteurized Process Cheese Spread, Whirligigs Caramels, Nabisco Rice Honeys – to name just a few! Nabisco makes me feel so . . . American. 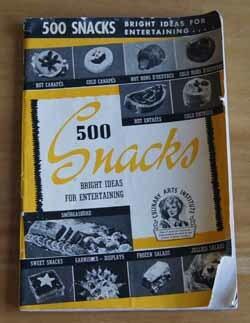 “Here for your delectation is the SPECTACULAR & RARE–NABISCO’S SNACK COOK BOOK by Mary Ellen Baker. TERRIFIC RECIPES for DELICIOUS SNACKS using NABISCO PRODUCTS!! PLUS—-there are L-O-A-D-S of gorgeous, mouth-watering FULL-COLOR photos!! This book was my mother’s. She did not comment on any of the recipes, and it’s in very good condition. If I keep it, it will be for nostalgia: it is a classic style of 60s and 70s manufacturer’s cookbook. Or I’ll keep it because any item that can go from 99 cents to 25 dollars . . . might be a good investment! 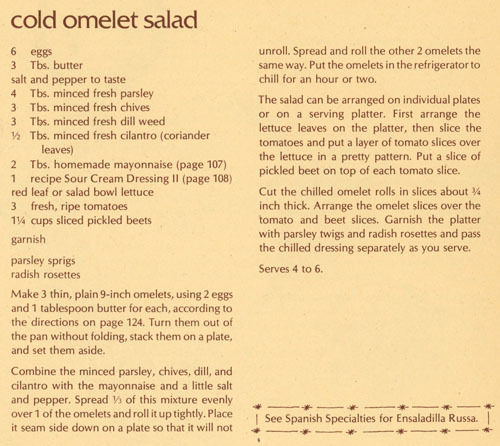 Here is an example of recipes in this book. Note the Stuffed Grape Leaves – more exotic than I expected. 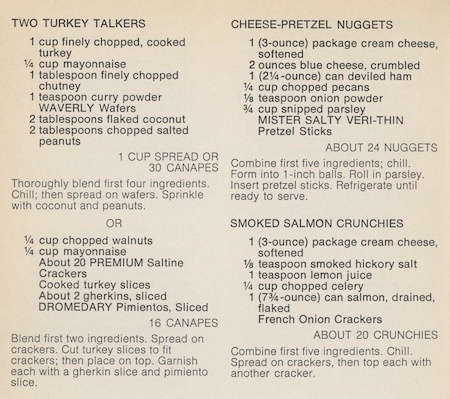 Note that it calls for “75 Cheese-NIPS Crackers”. Can you see counting those out? 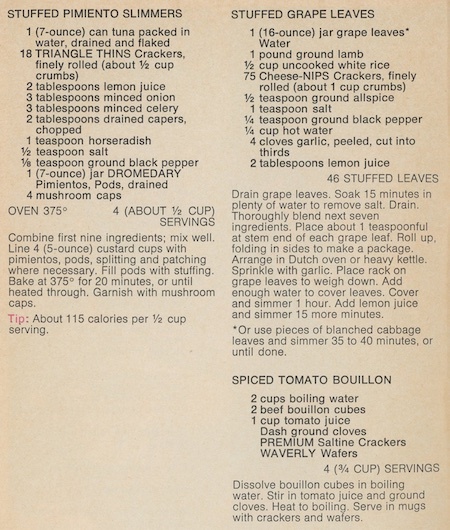 Or even “18 Triangle Thins Crackers” in the Stuffed Pimiento Slimmers. Note too that the “Slimmers” recipe includes a calorie count. A handful of recipes throughout this book include this data for dieters. Here are some more pages from this book. Sweet Snacks include Coconut Orange Dreams (stacks of three vanilla wafers layered with frosting – count out those 54 Nilla Wafers!) and Apricot Coconut Pixies. Cheese Neapolitan, pictured below, has 3 layers. The bottom layer is cream cheese and Parmesan cheese colored with tomato paste, the middle layer cream cheese and ricotta cheese, and the top layer cream cheese and Bel Paese cheese covered with parsley. 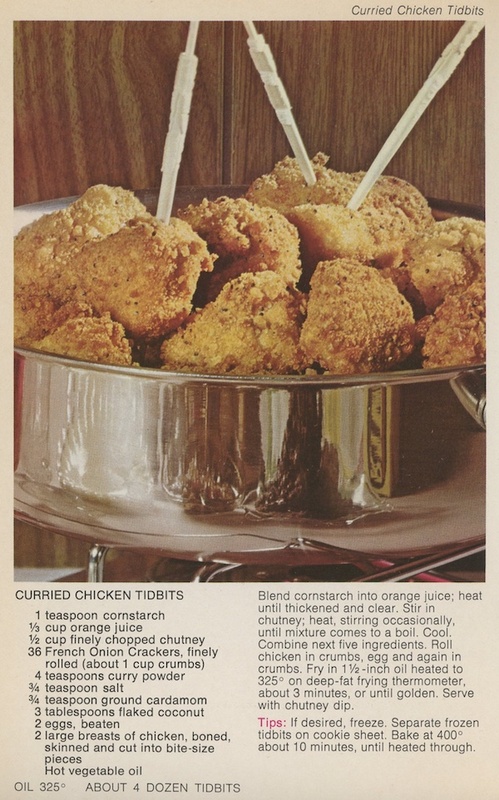 And one more, Curried Chicken Tidbits. In my opinion, red peppers have more flavor than expensive, hard to find canned pimientos. 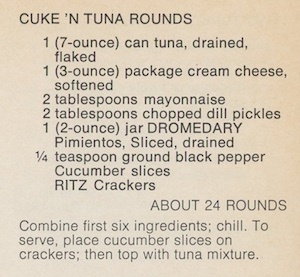 Tuna these days comes in 4- to 5-ounce cans (at least that is what I had in my cupboard), so I down-sized this recipe. Combine the tuna, cream cheese, mayonnaise, pickles, red pepper, and pepper. Chill. 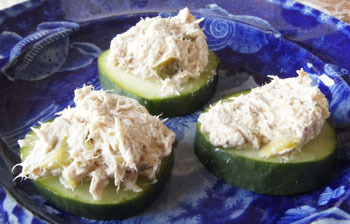 To serve, place a mound of tuna mixture on a cucumber slice. It would be good with crackers beneath the cucumbers too, but I left those out. We enjoyed these. In fact, it was our low-carb lunch on a picnic with our grandson to Meadow Park in Lyons. For us, it was “lunch” rather than a “snack”! For now, I am keeping this cookbook. It’s fun to look through old recipes. 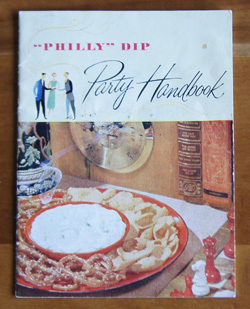 Cookbook #225: Philly Dip Party Handbook, Philadelphia Cream Cheese, circa late 1950s. Philly Dip Party Handbook is a paper booklet of cream cheese dip recipes. It’s only 4.5 x 6-inches and 20 pages long. Was it my mother’s? Grandmother’s? I am not sure, as there is no handwriting in this booklet. There is no publication date given, but from web searches, I learned that it was published in the 1950s or 1960s. 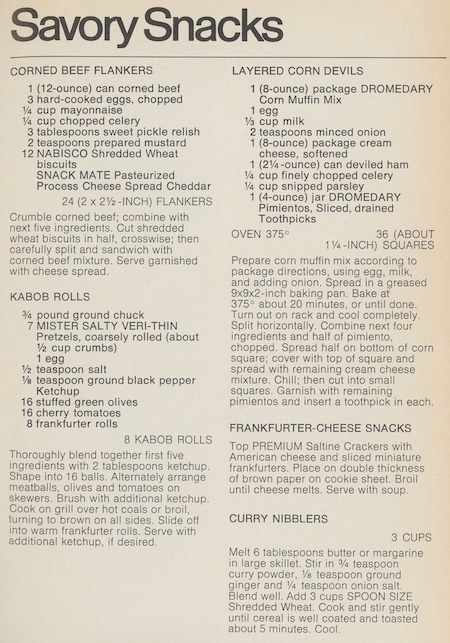 Each recipe includes Philadelphia Cream Cheese, “famous since 1880” according to the back cover. According to Wikipedia, cream cheese is made from a mixture of milk and cream. Bacteria is added so that the mixture coagulates, then it is heated to kill the bacteria. It is not “naturally matured”, and meant to be eaten fresh. The Wikipedia articls states that it is easy to make at home, but I don’t know anybody who does that! Commercial cream cheese has stablizers added, and sure enough, the package I bought has carob bean gum. I love cream cheese, but use it sparingly because it is high in calories, 90% of which are fat calories. I haven’t made a dip from cream cheese for ages! Since all of the recipes in this book include cream cheese as the main ingredient, I am just going to have to bite the bullet and make a rich dip. Most of the recipes include a little cream to make the cream cheese more spreadable. Most recipes also include Worcestershire sauce too, and from there, a variety of seasonings and sometimes a protein food (clams, crab, ham). When I picked up this book to start this blog post, I figured I’d recycle it. But I explored online, and found that it is quite popular. It is for sale on many websites, for example, the etsy site. The booklet goes for as little as 4 dollars and as much as 20 dollars. I guess a lot of people like to collect vintage cookbooks! Some artistic types may also use them for art projects. 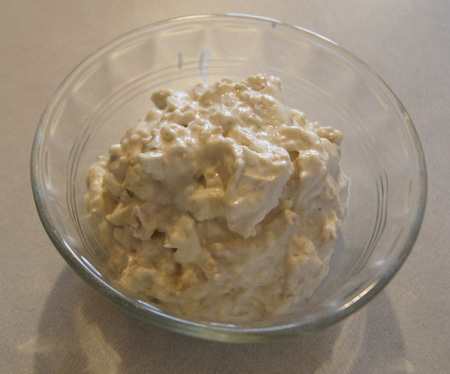 I decide to make Philly Clam Dip for this blog. Look at the little clam-shaped dish they put the dip in! 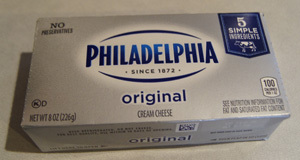 I bought Philadelphia brand cream cheese for my dip. It’s in the same grey and blue package as it was in the 1950s. 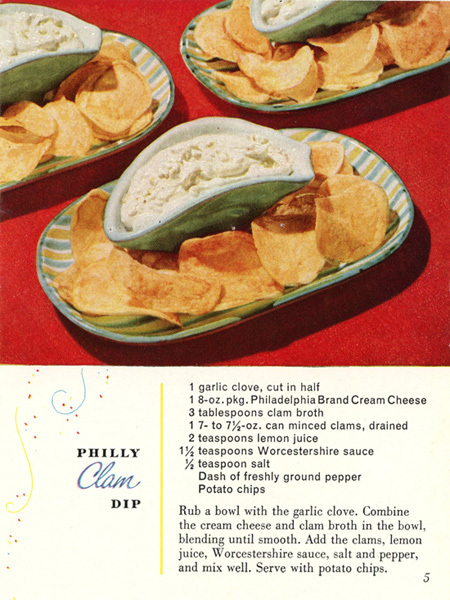 I remember with fondness clam dips from my childhood. 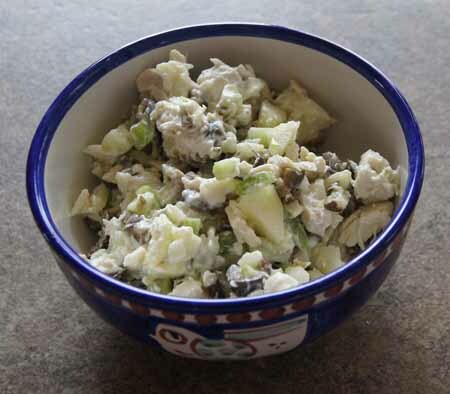 Often my father would make it, and he always claimed his was clam dip was the “best clam dip ever”. He might have added sour cream to his version. 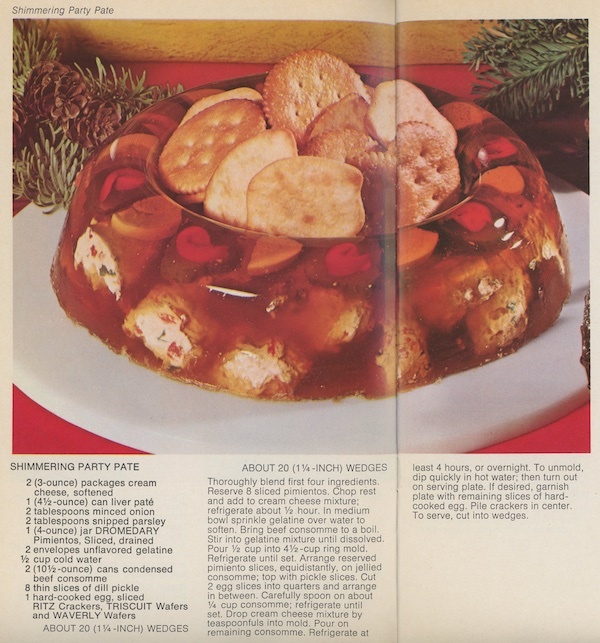 As for me, I’ll make it just like the recipe in the Philly Dip Party Handbook. Rub a bowl with the garlic clove. Combine the cream cheese and clam broth in the bowl, blending until smooth. Add the clams, lemon juice. Worcestershire sauce, and salt and pepper, and mix well. Yum, this was good! And rich. We each took a taste but will save the rest to share with family on Thanksgiving. The can of minced clams that I had in my cupboard was only 6.5 ounces. I put in most but not all of the package of cream cheese, because I wanted it clam-ier. I had a bottle of clam broth, and I compared it to the clam juice from the can – the clam juice from the can had a lot more flavor. It was salty, though, so I tasted the dip and decided not to add more salt. I have to admit that I didn’t really measure the lemon juice or Worcestershire sauce, I just guessed at the amounts, tasted the dip and added a bit more of each. A rich, classic clam dip to enjoy! 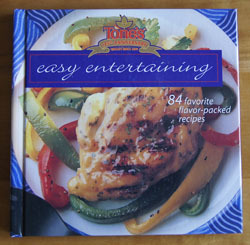 Cookbook #153: Easy Entertaining, Tone’s 125th Anniversary, Tone Brothers, Inc., Iowa, 1998. Where/when/why did I buy this cookbook? Dunno. But it is a pretty cookbook, nicely laid out, and some of the 84 recipes are tempting. I don’t find any post-its or writing in it. It’s in great shape! I’ll keep this cookbook. So what is “Tone’s”? I am unfamiliar with this brand. I learn in the first pages of this book that Tone’s is a brand of spices. In 1873, Jehiel and Isaac Tone founded Tone’s Brothers, Inc., in Des Moines, Iowa. The reason I don’t have any Tone’s spices on my shelves is that they are sold in warehouse stores, like Sam’s Club. None of those stores close to my small town of Lyons! Tone’s early product line included cinnamon, nutmeg, cloves, allspice, mace, and ginger. And, black pepper. But not black pepper like we have today! No, it was a mixture of pepper, ground olive stones, cayenne pepper, and black coloring. The black coloring was called “lamp black”, and it was made from soot. And we complain today about food additives! Thank you, brothers Tone, for the “revolutionary idea of selling pure ground pepper”. 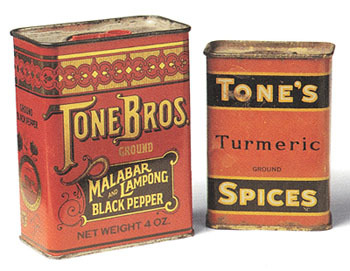 Tones Brothers introduced other innovations in spices, including selling spices in individual consumer units. At first, the containers were made of paperboard and tin. Tone’s was the first spice company to use clear plastic packaging (1980s). By the 1990s, they produced more than 250 varieties of seasonings and mixes. Tone Brothers was a family-owned-and-run business until the 1970s, when it was purchased by Mid-Continent Bottlers. Then it was swept up in the merger and acquisition frenzy of the business world, and the brand name has now been owned by a series of conglomerates. (Here is a good history of the company.) Tone Brothers registered these different trademarks: Tone’s®, Durkee®, DecACake®, Spice Islands®, Spice Advice®. Tone’s current website is here. The 84 recipes in this book range from appetizers to salads and sides to main dishes to desserts to beverages. A few years ago I tried the “Mesa Corn with Chili-Seasoned Pork” and liked it so much I added it to my personal recipe files. I’d also like to try: Greek Cauliflower Dip, Coconut Pork Stir-fry, Quesadilla Pie (flour tortillas layered with with rice, chicken, and cheese), Broccoli Pesto Fettucine, Spanish Gaspacho Salad, Sesame Spinach Salad, French Potato Salad, Tuscan Green Beans, and Zucchini Raisin Wheat Muffins. 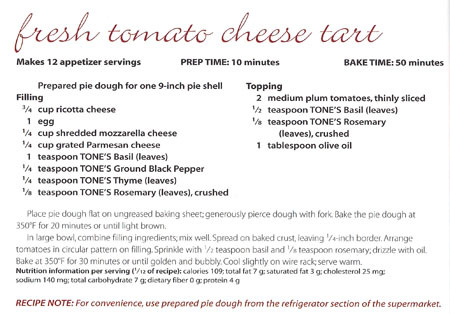 For this blog I choose to try “Fresh Tomato Cheese Tart”. I hope it turns out as good as it looks, because I plan to take it to a potluck dinner-meeting. 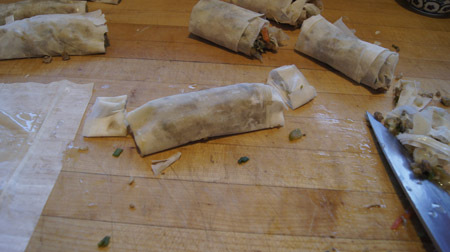 I decided to use dried basil in the filling as called for in the recipe, but fresh basil for the top. Roll the pie crust to a 9-inch circle. If you make your own, you will need to cut it neatly around the edges. 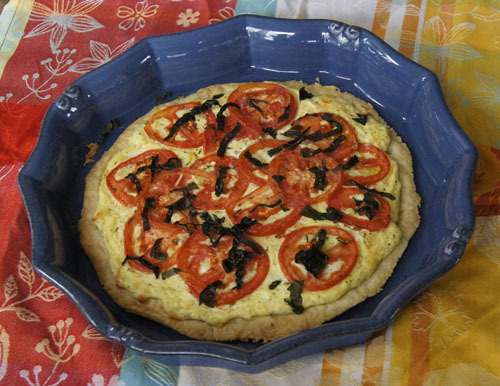 Place it on a piece of parchment on a baking sheet, or put it in a large pie plate, like a quiche dish. Poke a lot of holes in it with a fork. Bake at 350˚ for 20 minutes, or until light brown. Let cool before adding the filling and topping. 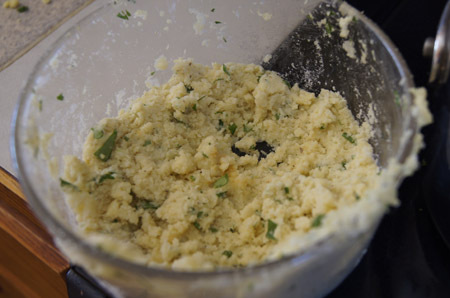 For the filling, whisk the egg, then whisk in the ricotta cheese and the remaining filling ingredients. Spread carefully and evenly on the crust, leaving a 1/4-inch border. Arrange the tomato slices on top in a single layer. Sprinkle with the basil and rosemary. Drizzle with the olive oil. This was delicious! Savory and rich. I strongly recommend the fresh basil – it adds a burst of flavor and color to this dish. Next time, I think I’ll put the fresh basil leaves under the tomatoes. 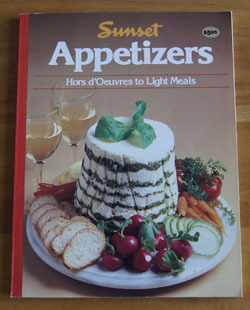 Cookbook #142: Appetizers, Hors d’Oeuvres to Light Meals, Sunset Books, Lane Publishing Co., Menlo Park, California, 1984. My recipe repertoire is wanting in the appetizer category. Usually I focus on a full meal, and don’t want people filling up on snacks and killing their appetites. But some appetizers are dang tasty! How can I fit these into a balanced eating plan? How about a whole meal of different small plates or appetizers? Some protein, some vegetables, some richness. I’ve done this a time or two and it is fun. 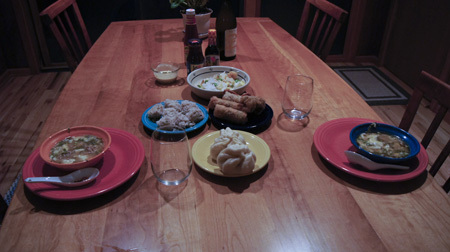 This holiday season, in the limbo area between Christmas and New Years, I decided to entertain with just such a meal. I pulled Appetizers, Hors d’Oeuvres to Light Meals from the shelf for ideas. A bit hesitant at first with a 30 year old appetizer book in hand, to my surprise I actually like the recipes in this cookbook! 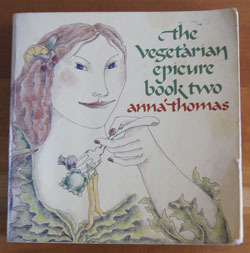 I don’t think I have ever looked at this book before (it came from my mother’s collection). The photographs in this Sunset book are great, too. I marked many recipes to try: mini bagels, cheese twists, cheese herb pretzels (all these are from-scratch doughs), spinach dip, sugar snaps, chili peanuts (from raw Spanish peanuts), shitake spinach soup, carrot soup, potato pancakes with apples and goat cheese, dried tomatoes (how to make your own dried tomatoes), shrimp avocado salad, crab puffs, baked shrimp, and falafel meatballs and mushrooms. Mother only marked one recipe: “Shrimp Dip”, made from cream cheese, sour cream, greeen onions, and cooked shrimp (she used canned shrimps). She called it “Delicious”. 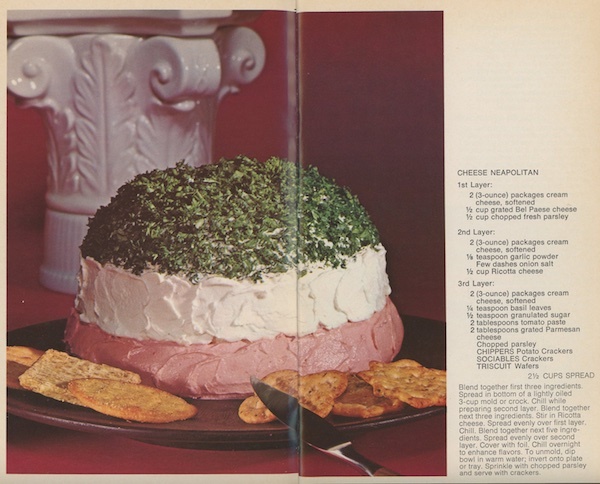 My parents often got together with their friends for cocktail parties, and these sour cream-cream cheese based dips were popular in that era. My favorite was a clam dip. One more plus for this cookbook. A lot of the recipes can be made ahead or at least a lot of the prep work can be done the day before. I find this book friendly and helpful! 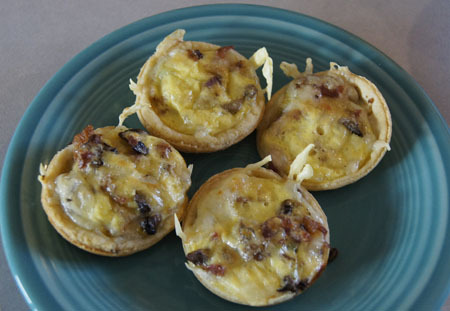 I decide to make Appetizer Mini-Quiches for this blog. These should smell wonderful coming out of the oven, bacon and cheese in a home-made pastry. Yes they will take a little fuss, but I’ll use the help of my “girls” (daughter and daughter-in-law) and it will be fun. I made the filling the day before, and cut the recipe in half. Below is my version. Cook the bacon; remove from pan and crumble. Leave a little of the bacon fat in the pan, then cook the mushrooms in it. 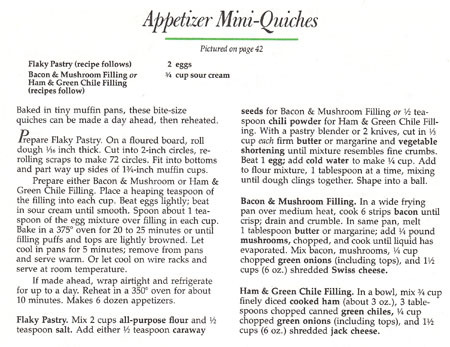 Combine the bacon, mushrooms, green onions, and Swiss cheese. Beat the egg and add the sour cream. Set the bacon mixture and the egg mixture aside while you prepare the pastry. Have ready a muffin pan – or “pans” if you have more than one. The bottom of each of my muffin tins measures about 1 3/4-inches. I did not grease the pan. Roll the dough about 1/8 to 1/16-inch thick. 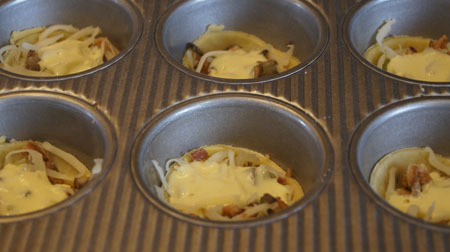 Use a 2-inch biscuit cutter to cut circles of dough, and put the circles in the muffin pan cups. 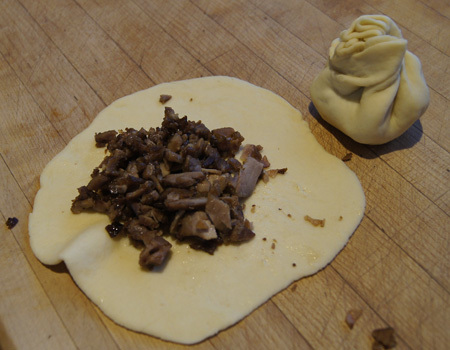 Continue re-rolling scraps of dough until the pastry is used up. I had help rolling these out! We made about 28 cut-outs. Divide the bacon mixture on top of the pastry in the pans. Then, spoon about 1 teaspoon of the egg-sour cream mixture on top of the bacon mixture. Here they are ready to bake. Bake at 375˚ for 20-25 minutes, until the filling puffs and the tops are lightly browned. These were so good it was hard to get them onto a serving plate before they were all eaten! A winning recipe. 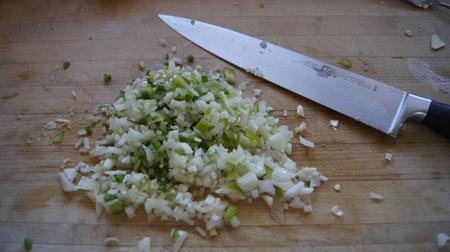 Note that these can be varied easily, for instance, the original recipe has a variation of ham, green chiles, green onions, and jack cheese. You can make these ahead of time and reheat in a 350º oven for 10 minutes. Cookbook #93: The Cooking of China, Emily Hahn and the Editors of Time-Life Books, Time-Life Books, NY, 1968. Foods of the World series; fifth printing, revised 1976. Mickey was a young woman from Missouri living in Shanghai in the late 1930s. She had an affair with a Chinese poet, took her pet gibbon to dinner parties, became addicted to opium (“though I had always wanted to be an opium addict, I can’t claim that as the reason I went to China”), moved to Hong Kong in 1940 and had an affair with the local head of British Army Intelligence. Way before all those happenings, she was the first American woman to earn a degree in engineering, a pursuit she chose only after being refused permission to take a chemistry class. After college graduation she drove across the US with a woman friend, and they were both disguised as men. All during her adventures, she was writing: 52 books and nearly 200 articles and stories. And who was Mickey? Emily Hahn, the author of this book! The statements above are all from an article about her on Wikipedia. I am so intrigued that I am going to search the University library for one of her books – China to Me: A Partial Autobiography. 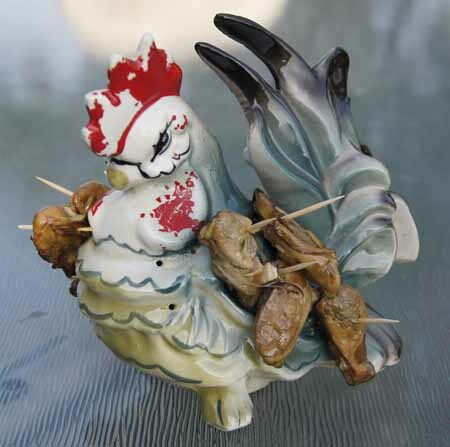 The writing in The Cooking of China reads like a gathering of stories. It is fascinating. 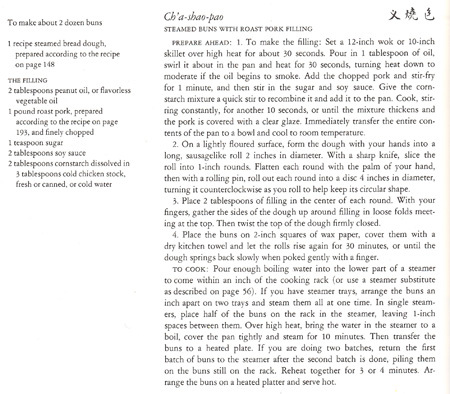 At the end of each chapter are recipes, written by Florence Lin and Grace Chu, teachers at the China Institute in New York. The Foods of the World series editor Michael Field was responsible for recipe and food presentation. Michael Rougier, a Life photographer, did the stunning photos in this cook book. 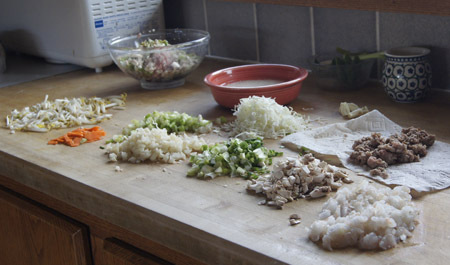 Emily Hahn covers the history of Chinese cuisine and the different cooking styles of the main four regions. She presents diverse cooking ingredients and methods, supported by photographs. Her opinion of the Red Guards who appeared in the late 1960s is quite clear. 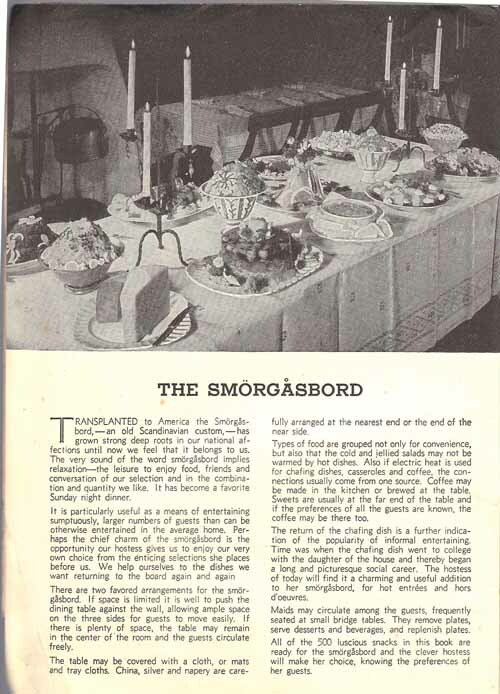 And she describes great dinner parties, ones she attended or imagined ones from the past. I love this book. 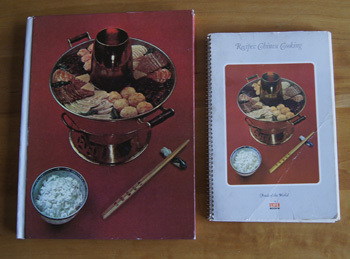 It’s been my reference for Chinese cooking for over thirty years. Granted, some of the recipes are just too much work to follow, and some of the ingredients are difficult to find (bird nests? shark fins?). But to me, it is the source for Chinese cuisine. Now that I discovered Emily Hahn’s personal story, I like the book even more. The Cooking of China is actually a set of two books: the large hardcover book, and an accompanying spiral bound collection of the recipes. I counted these as one book in my database. The recipe that I have used the most is the one for Pearl Balls. 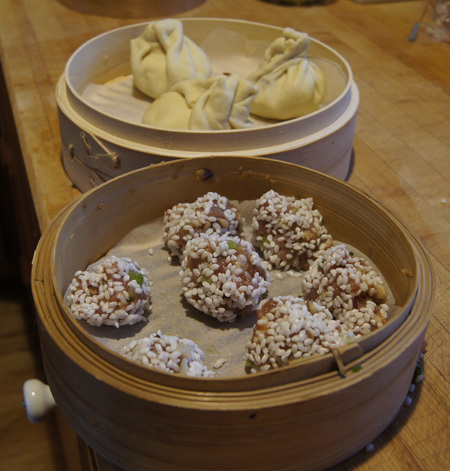 For this blog, I decide to try Steamed Buns with Roast Pork Dumplings. I have wanted to make steamed buns ever since a graduate student from China brought them to a dinner party way back in the seventies. But: the work! Now I have the time and experience to try these. It involves making the roast pork, the yeast dough, and finally assembling the rolls and steaming them. And since it’s a Chinese meal, I will also be making pearl balls and egg rolls as well as a soup and rice. So it will be a project. I look forward to this adventure in my kitchen! To make the dinner-day easier, I prepare the roast pork a couple days ahead. Here is the original recipe for Roast Pork Strips. I don’t have brown bean sauce, only hot bean sauce (see my Asian ingredients reference). A trip to the Asian Seafood Market! I have to ask the lady in the market, and she assures me that “bean sauce” is what I want. 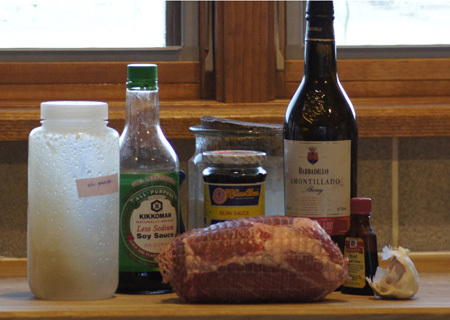 The marinade step is easy, but roasting? They direct me to hang thick pork slices off hooks in the oven above a pan of water. Well, I did that, using skewers, and it worked. But I think it could be cooked on a rack in any roasting pan instead. I’ll include both methods in my version of this recipe. Cut the roast lengthwise into 3 or 4 thick slices (1 1/2-inch – 2-inch slices). 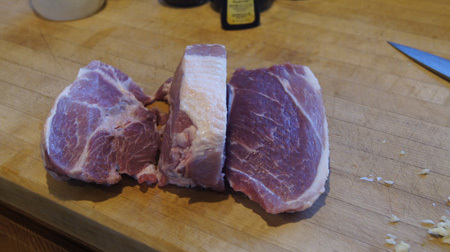 Then cut each slice in half lengthwise so that you have 6 or 8 long, thick slices. Combine the marinade ingredients in a bowl. 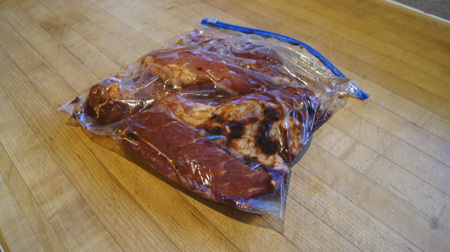 Put the meat and marinade in a large ziplock-style bag and carefully close it, eliminating as much of the air as you can. Set in the refrigerator for at least 6 hours. If you remember, turn it over from time to time. 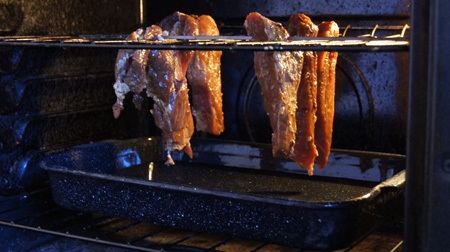 To cook the roast strips, you can probably place them on a rack over a parchment or foil lined pan, or a pan with a couple inches of water in it, and bake first for 45 minutes at 350˚, then for 15 minutes at 450˚. Turn on the oven to 350˚ and bake 45 minutes, then increase the temperature to 450˚ and cook another 15 minutes. Carefully remove the skewers and pork from the oven and cool. Store the pork in the refrigerator until you are ready to cook the rolls. 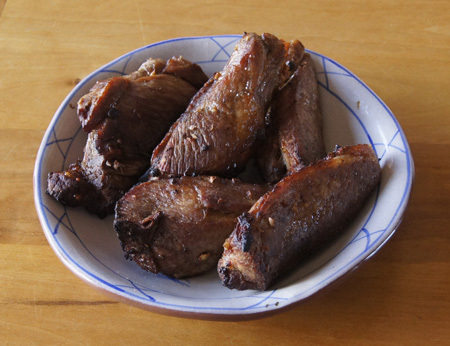 Traditionally, these pork strips are sliced into paper-thin slices for serving as part of a meal. 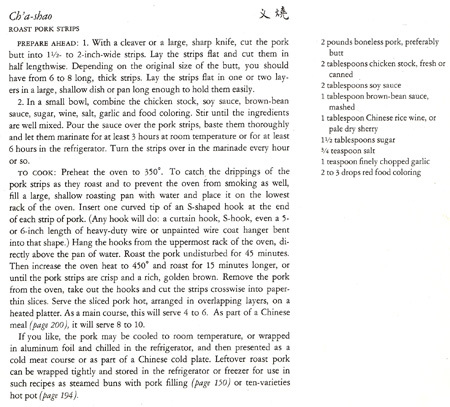 Here is the original recipe for Steamed Buns with Roast Pork Dumplings. I made a half-recipe and used my bread machine to prepare the dough. I steamed them in Chinese style bamboo steamers set in a pan of boiling water. I lined the steamer trays with parchment for easy cleaning. My version of steamed buns follows. Put the dough ingredients in a breadmaker set to the dough cycle, or knead the dough by hand and let it rise until double. Prepare the filling while you wait for the dough. 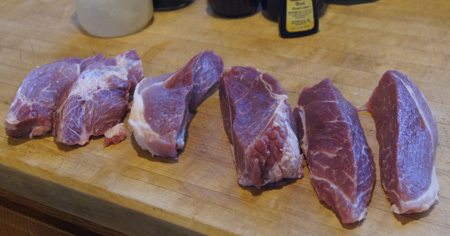 First, chop the pork strips into small pieces. Cook in a small amount of hot oil for a minute or so, then add the sugar and soy sauce and stir for a minute. Add the corn starch mixture and stir for about 10 seconds, until the mixture thickens and the pork is covered with a clear glaze. Take it off the heat and transfer to a bowl to cool. When the dough has risen, punch it down and roll into a long cylinder about 2 inches in diameter. Cut the cylinder into 12 sections. Roll each section into a circle about 4 inches in diameter. Put the filling on the dough circles. Gather the sides of the dough up around the filling in loose folds meeting at the top. 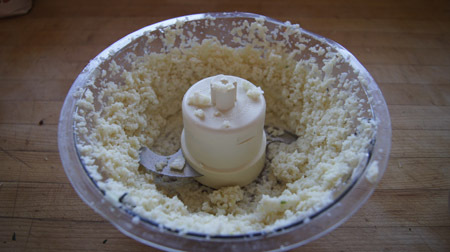 Then twist the top of the dough firmly closed. 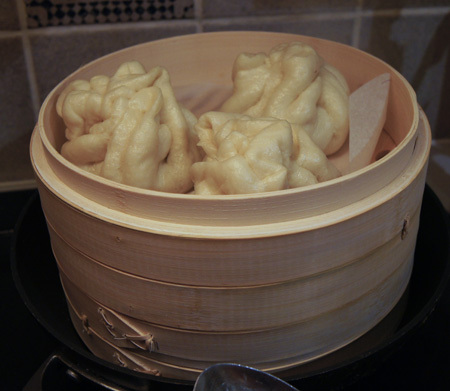 Steam the buns for 10 minutes. The buns I made had more dough than I like. I followed the recipe in the book carefully, measuring the size of the dough cylinder and the size of each round. But, I only made 9 buns from all the dough. I should made 12! Next time I will make them as I wrote in the above recipe and I am sure they will be perfect. I served these with egg rolls and pearl balls and fried rice and sour-and-hot soup. I had sweet and sour sauce on the table and also a bottle of “banana sauce” that I picked up at the Asian store. These sauces were good with the steamed buns. Success! I finally made steamed pork buns and they are great. I now have another Chinese recipe to add to my repertoire. The recipe below is adapted for my tastes. I believe the fresh ginger and water chestnuts to be essential in Pearl Balls, and I buy the best quality ground pork that I can find. These can be used as appetizers or to round out a Chinese-style meal. Start the rice soaking in a cup of water before you begin the Pearl Balls. About an hour’s soak is enough. Combine the pork with the rest of the ingredients and mix well. 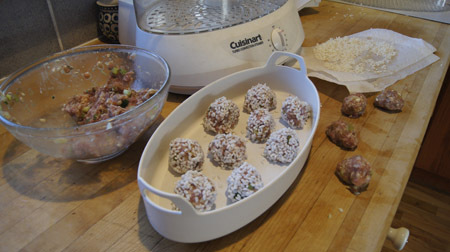 Form the mixture into 1-inch meat balls. Drain the soaked rice through a strainer and lay it out on a paper towel. Roll one pork ball at a time in the rice, pressing down gently but firmly as you roll so that the rice grains adhere to the meat. Steam the pork balls for about 30 minutes. 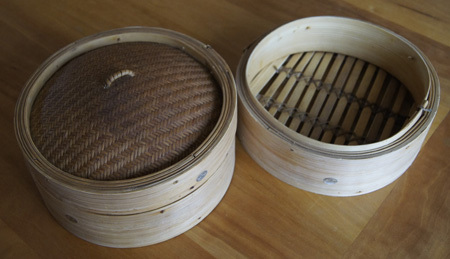 I use an electric steamer; a bamboo steamer set in a wok also works. 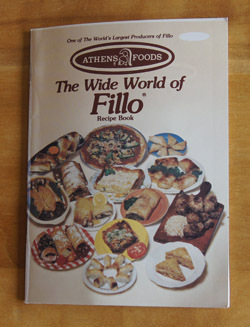 Cookbook #84: The Wide World of Fillo, Athens Foods, Cleveland Ohio, 1980. 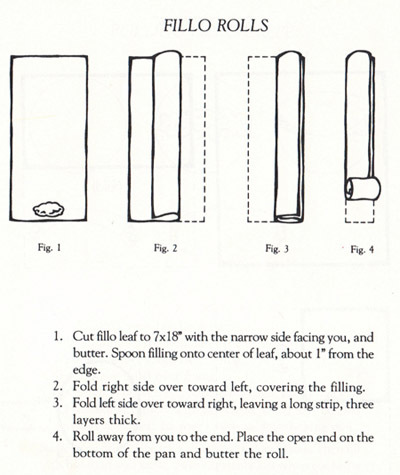 Small as it is, this pamphlet has about 50 recipes using fillo dough and helpful instructions for working with this thin pastry. “Fillo” is usually spelled “phyllo” or “filo”. Phyllo is a wheat dough stretched into paper-thin sheets. Wikipedia: “The practice of stretching raw dough into paper-thin sheets probably evolved in the kitchens of the Topkapı Palace”. Hey, I’ve been there! The Topkapi Palace is in Istanbul, Turkey. We visited it in 2013. During our stay in Turkey, we often enjoyed phyllo savory entrees and sweet desserts. I have stayed away from phyllo dough recipes, thinking them fraught with calories, because you brush butter between the layers of dough before you bake it. But the introduction to The Wide World of Fillo claims that only 2 tablespoons of butter is used per sheet of pastry, resulting in a dish that is “much lower in calories” than comparable fried dishes. I’m still not convinced that this is true. It’s hard to estimate how many calories are added when deep frying. But I don’t enjoy deep frying – too much splattering. An alternative is welcome. Note that the directions in the above recipe do not tell you when to add the soy sauce. I’ll add at the very end of the stir-fry cooking. Feel free to swap up any ingredients in this recipe. The amounts stated yield about a dozen rolls. You can use any vegetables you have on hand, and include pork or shrimp or any other meat. Consider the recipe below a rough guide. Stir-fry the celery, cabbage, mushrooms, carrots, and green onions in a little hot oil for a minute or two. Add the shrimp and pork and stir-fry just until the shrimp is done. Add the water chestnuts, bean sprouts, ginger, garlic, and sugar. 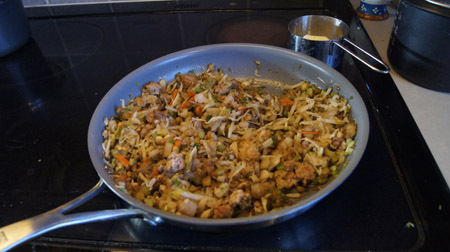 Add soy sauce to taste (and cornstarch if you want) and stir-fry until heated through. Cool to room temperature. Lay out a sheet of phyllo pastry. I suggest laying the phyllo-sheet-rectangle out with a long side facing you, then making two vertical cuts to cut it into three pieces (see photos). Brush one of the third-sheets with butter, then place about a quarter cup of the filling just above the bottom edge, on the edge closest to you. 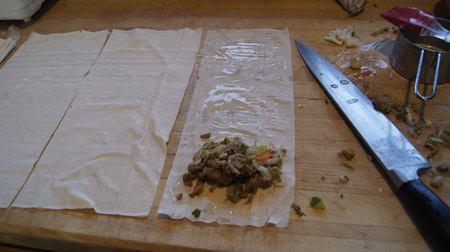 Fold in the sides and roll up, or simply roll up. Place the roll on a parchment-lined half sheet pan and brush the top with butter. I had a bit of trouble with the dough breaking, before and during the rolling process. The pamphlet suggests keeping the pastry sheets covered with a wet towel whenever you are not actively rolling it. That was hard to do! See my photos (below). Bake at 375˚ for 20-25 minutes, until golden brown. The egg rolls are golden brown and deliciously flaky. The filling is perfect. And those little rice covered balls? Those are my Pearl Balls. These were delicious! They were still a pain to fill and roll up, though. That’s partly because I’m not real patient. As the book states, you should carefully remove a sheet and then constantly keep the dough covered with a wet paper towel. It dries out very quickly. And the dough sheets are so very delicate they want to tear if you just look at them. I was trying to take photos and butter dough sheets and fill pastries and deal with a couple total rolling failures all at once. I am sure I got a bit of butter on my camera. Anyway. In the photo below, I cut a piece of dough lengthwise into two pieces, then buttered them. Then I put about 4 tablespoons of filling above the bottom edge. 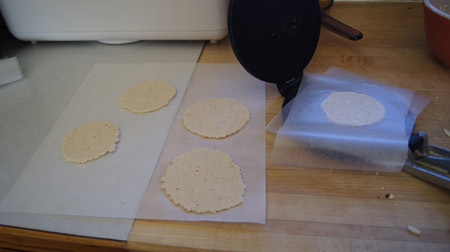 In the next photo, I have folded in the sides of one of the pastry strips and will next roll up the dough. From here, I quickly rolled the filled sheet without folding in the sides. It wanted to soak through, but I kept rolling. When done, I cut off the ends. These baked up beautifully (the photo is up above). I would definitely make them again. The original recipe said to use a pound of phyllo dough; I only used 4 sheets (plus the couple I ruined) which is only about a fifth of a pound. (I do like this larger filling-to-dough ratio.) I used about a quarter cup of butter, so that is about 400 calories total, or an addition of 35 calories per egg roll. I think if you are careful and neat, you could probably use even less butter. 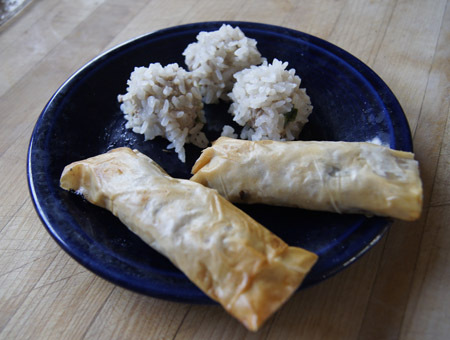 So maybe these are a lower-calorie alternative to deep-fried egg rolls. They sure are good. Will I keep this tiny cookbook? I guess I will. 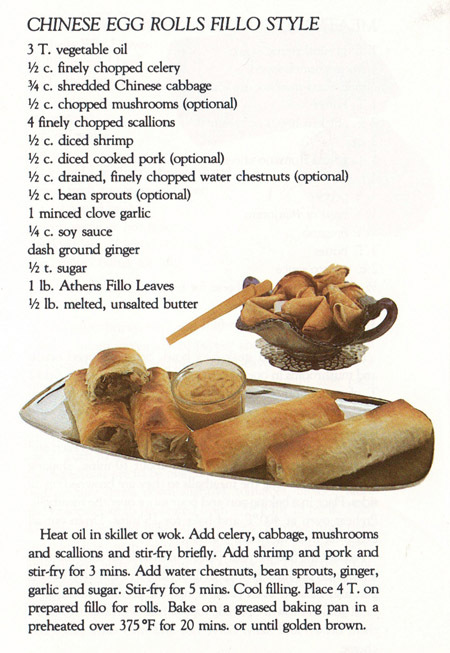 It has good instructions for using phyllo dough and I might try another of the recipes someday. 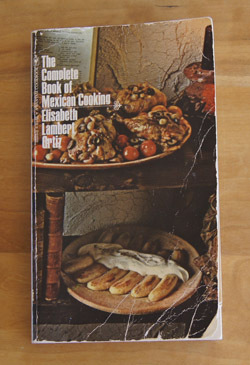 Cookbook #57: The Complete Book of Mexican Cooking. Elisabeth Lambert Ortiz. The Condé Nast Publications, Inc., US, 1967. I bought this paperback cookbook for myself, probably used. 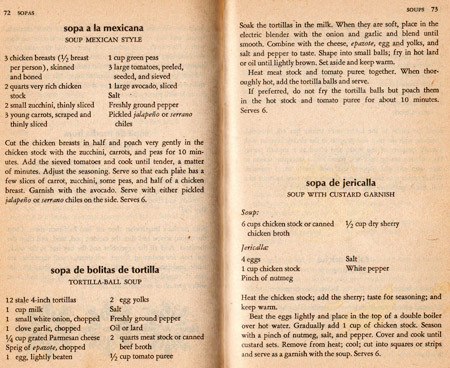 Chronologically, this book was published between the other two Mexican cookbooks that I have covered in this blog: Elena’s Secrets of Mexican Cooking (1958) and Sunset’s Mexican Cookbook (1972). I think I bought it at a used book store sometime in the 70s. I was quite worn out after that long 1913 cookbook post, and wanted a quick and easy cookbook to discuss. And I wanted Mexican food. So I took The Complete Book of Mexican Cooking off the shelf and flipped through to find an easy casserole. And then I got caught up in the author’s story and a plethora of interesting recipes. I was hooked. I read the rest of the 6-page forward and went on to the introduction. Elisabeth (first name of the author: I feel like I know her now!) recounts how the native cuisine of the Aztecs brought foods then unknown outside the Americas: chocolate, vanilla, corn, chiles, peanuts, tomatoes, avocados, squash, beans, sweet potatoes, pineapple, and papaya. I learned this earlier from Elena’s cookbook, but I still can’t get over the fact that chocolate and vanilla and corn were not known by Europeans until the discovery of the Americas. I sure am glad I was born when I was. The chapters of the book are: The Corn Kitchen, Soups, Sauces, Eggs, Fish, Poultry, Meats, Vegetables, Salads, Desserts, and Drinks. Each chapter has an introduction; this is a personal and friendly book. I do like the recipes: fresh ingredients and meals made from scratch. 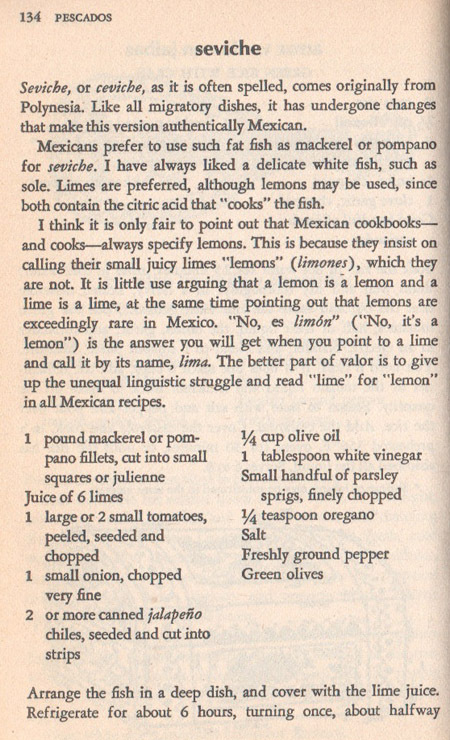 Even though the book was published over 45 years ago, I can still use most of the recipes “as is”. They aren’t weird, is what I am saying. They are useful. I was looking for a mid-week meal. I sort of wanted a very simple Mexican casserole, with hamburger. 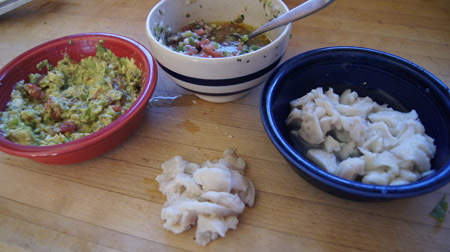 But I came to a recipe for seviche, and that got me started on a bigger plan. We last had seviche (or ceviche) at The Fork in Lyons. They put it in tiny taco shells. I want to make seviche and put in on small tortillas and then . . . what to go with it? I found a recipe in this book for tortilla ball soup that uses stale tortillas: what a great idea! I decide to round out the meal with a Mexican-flare salad on each plate. What is seviche? It’s raw fish “cooked” in an acidic liquid. As a chemist, this has always intrigued me. I haven’t made this delicate and tasty treat in years. 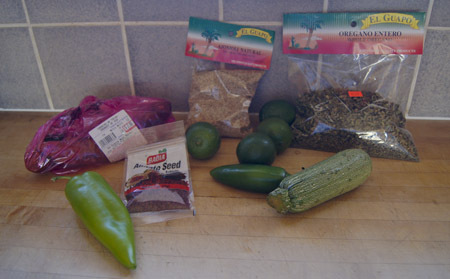 The recipe includes a salsa for the seviche, and I have all of the ingredients on hand. The Fork’s appetizer inspired me to make my own mini-tortillas to go with the seviche. I haven’t made my own tortillas in years. 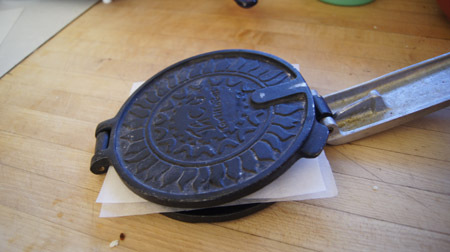 Can I find my old tortilla press? Clomping down the basement stairs, I rummage in the kitchen stuff I store there. Can I find it . . . yes! Now, how do I use it, where is my recipe? This is where being a pack rat really comes in handy. I am the database queen. When I first discovered Filemaker at work way back in the 80s, I felt databases were created just for me. After I entered all of the chemicals at work in Filemaker, I got a copy for home and used it to enter all of my clipped recipes and instructions on one of my early Macs. I will use mahi mahi because I have some in my freezer. I have a fresh jalapeño, so will substitute it for canned ones. Cilantro: the salsa begs for cilantro! I will serve it piled on the small homemade tortillas, and instead of mixing the seviche and salsa, I will spoon a little of each on the tortillas. Below is the plated meal: Showing you why I went to all the work! 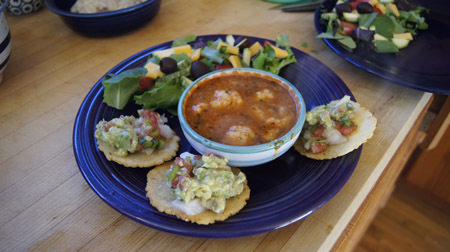 Seviche on tiny tortillas with guacamole and tortilla ball soup and salad. Prepare a salsa with the tomatoes, peppers, olive oil, fresh lime juice, vinegar, herbs, and olive oil. Chop the onions and peppers quite fine. This salsa will top the very delicate seviche, and I think it’s worth the extra effort to make a finely-chopped salsa in this case. Here is the salsa and the seviche. Yes, I made guacamole too. 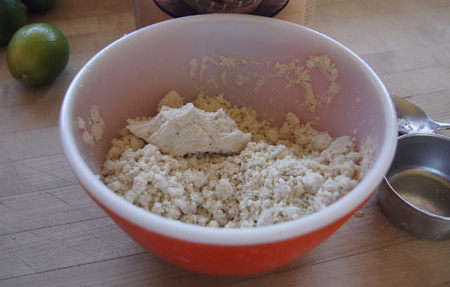 For the tortillas, mix the masa, water, and salt to form a dough that will just hold together. Let it rest 15 minutes to an hour. 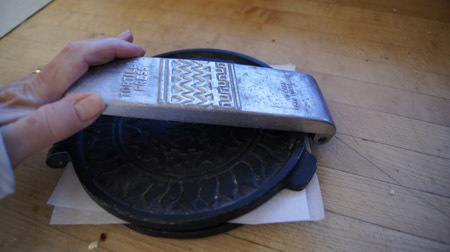 Cut pieces of wax paper in squares that cover the inside of the tortilla press: two squares will make two tortillas. (Parchment does not work – I tried it.) 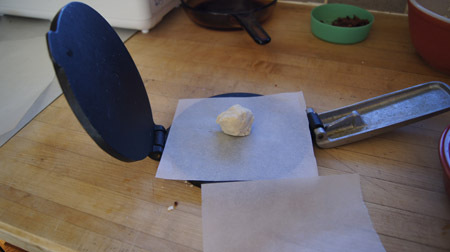 Place a piece of wax paper on one face of the tortilla press, then add a small ball of dough. 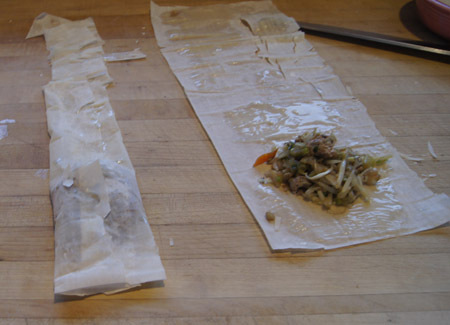 Cover the dough with another piece of wax paper. Close the press and apply pressure for a couple seconds. Open, and carefully remove the papers. 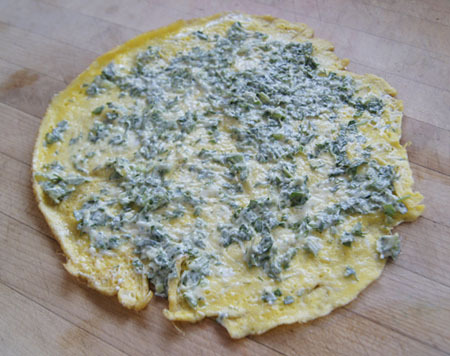 You will have to experiment a bit with the amount of dough to make a small tortilla (about 3-inch diameter). Also, if the dough sticks too much to the paper, add a bit of masa flour to the dough; if it won’t make a ball at all, add a bit more water to the dough. 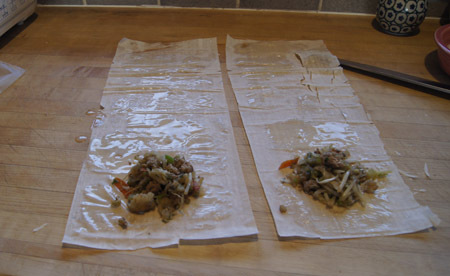 You can re-use each piece of wax paper once by putting the used side against the press for a second pressing. 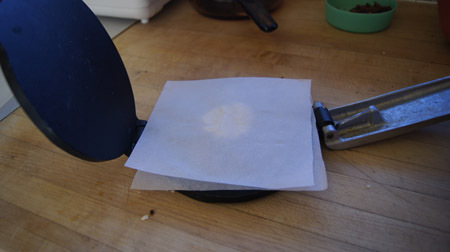 Carefully transfer each pressed tortilla onto a large piece of parchment. If you don’t plan to cook these immediately, cover with plastic wrap. To cook, put an inch or so of vegetable oil in a heavy pan. 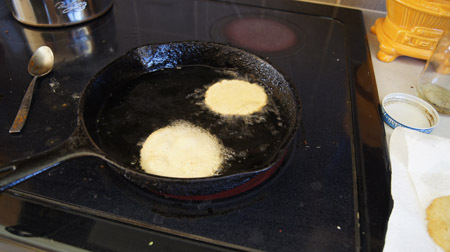 Heat over high heat until it pops and sizzles when you carefully toss in a drop of water. 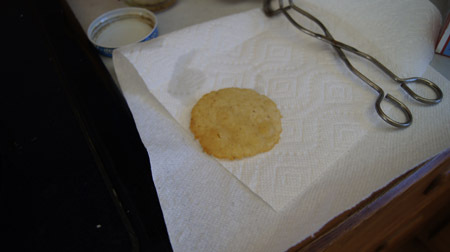 Turn down just under “high”, then carefully transfer the pressed tortilla dough into the oil. You can cook a couple at a time because they are so small. Fry each until golden brown, then transfer to paper towels to drain and cool. To assemble, place a teaspoon of seviche on each tortilla, then top with a teaspoon of salsa. I added some guacamole too – just couldn’t resist! My photo is above, where the recipe starts. I broke tradition and showed you the results first! I made a salad (lettuce, olives, cheese, peppers) some Tortilla Ball Soup to go with the seviche. Below is the author’s version of this soup; I made many changes. The store was a wonder. 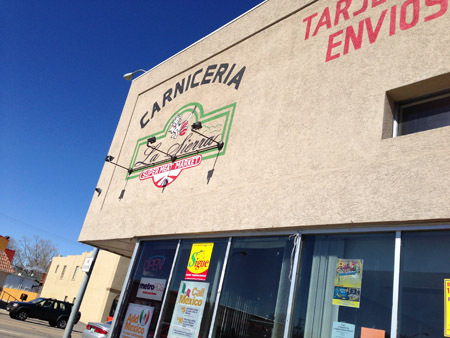 Fresh butcher-served meats, including tripe and lots of sausages as well as pork and chicken; shelves and baskets of spices and chiles; canned goods; cleaning items; cell phones; lots of fresh produce. I looked through both the spices and the fresh produce, but could not find epazote. 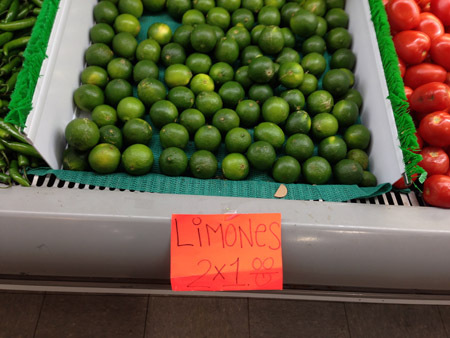 I did find limones! I gave up and asked the store clerk, trying to say the word and then spelling it. “Epazote, yes, we usually have it”, she said, carefully pronouncing it “ep a szot ee”. But alas, none today, I should come back tomorrow. I was almost jumping up and down, excited that soon I’ll be able to taste this exotic (to me) herb. My moseying around the store filled my basket with quite a bit of items. Chorizo, because this Mexican sausage is made differently by every store that produces it. Limones, because one can never have enough. A huge bag of oregano for only $1.29 – no way do I need this much, but, oh well! The annato seeds? Don’t know what I am going to do with them, but I have used anchiote paste made from annatos for carnitas. A big cheap bag of sesame seeds. A zucchini-like squash. And limes and peppers. After my adventure, back home and to making Tortilla Ball Soup. I made a ton of changes to the printed recipe. I cut the amounts by a quarter, and still had way too much dough. It was hard to cut “1 egg and 2 egg yolks” by a quarter, and the one-egg that I added made the dough too sloppy. I suggest using cheap yellow corn tortillas, since the type I used did not soak up the milk very well: my food processor never did get the tortillas into a fine mush. Here is the dough after the addition of some egg and a little masa. I used cilantro for the missing epazote. I made lots of additions to the basic beef broth/tomato puree specified in the cookbook: pinto beans and peppers (bells and hot peppers) and more onions and garlic and a little tomato and some cooked chorizo. I also added dried oregano and plenty of cilantro. After the broth and soup ingredients were hot, I carefully dropped in my sort of messy tortilla ball dough. Some cooked in balls, some sort of dissolved into the soup. 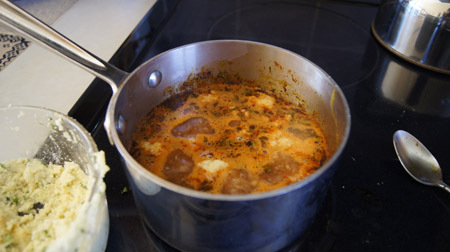 Below is the soup bubbling on the stove. 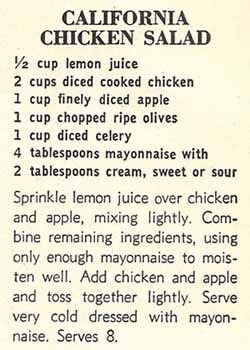 This recipe needs work, but it has potential! As to the whole meal, it was perfect. Soup, salad, and seviche, yum.